Former model Debi Gibson, 42, from Stoke-on-Trent, has been given weeks to live after using sun beds without goggles from the age of 14, which caused fatal eye cancer. 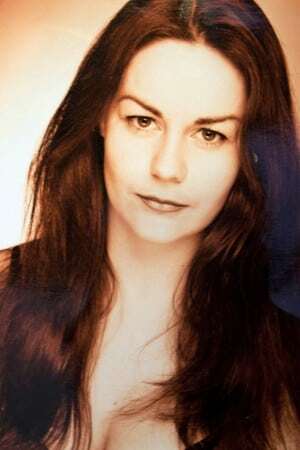 Debi, 42, was a model and actress in her younger days and desperate for sunkissed skin she bought a sunbed at the age of 14. But she refused to wear goggles while topping up her tan because she feared the protective eyewear would leave unsightly lines on her face. Debi was dying for a tan. Now the mum-of-one has been given weeks to live after developing fatal eye cancer and she blames the sunbed for her terminal disease. 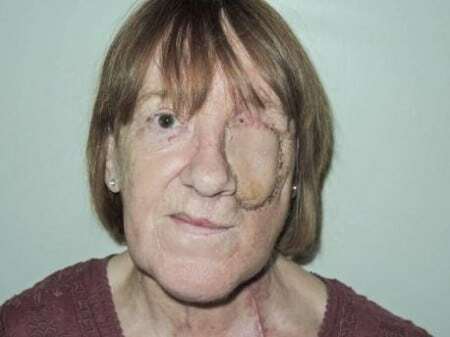 She was given the devastating news by doctors after they removed her left eye. Now Debi, who has a seven-year-old daughter, sienna, is being forced to write her will after being told the disease has spread to her liver. ‘It’s here!’ my mum, Joan, called up the stairs, hearing the delivery van pull up outside. Glancing out of my bedroom window, I spotted the driver unloading a large box. ‘Finally!’ I squealed, as I dashed down to open the front door. As soon as the package had been wheeled into the house I excitedly tore open the brown cardboard box it came in. I was 14 years old and had spent six months saving the £5-a-week I earned from my paper round to buy my own sunbed. Flicking through my mum’s catalogues, I had found the exact model I wanted. But the £120 price tag meant I had to scrimp and save all the money I earned to be able to afford it. Determined, I was up and out of the house by 7am before school each morning to deliver the papers and every penny in my pay-packet went straight into my piggybank. Eventually I had scraped together enough cash to splash out on the sunbed. Putting it together, the stand slid under the bed while the fluorescent tubing pulled down over me as I lay down. ‘You’ll shrivel up under there,’ my dad, Jack, would warn me. Although the sunbed came with a safety manual and instructions, I ignored the 30 minute recommended bathing time. Desperate for a golden glow, I often topped up my tan for an hour on each side five times a week. And when it came to the eye protection – which looked like swimming goggles – I threw them back in the box. With a black elastic band to fasten them on I thought they would leave ugly white lines across my face. Debi as a model when the sunbed tanning was at its height. At college, where I studied a hair and beauty course, my friends were jealous of my bronzed skin and they couldn’t believe I had got my own sunbed. Four years later, I moved away from my hometown of Bentilee, Stoke-on-Trent, to pursue a career in acting and modelling. I started a BTEC course in Performing Arts at East Berkshire College, Langley, and then went on to study towards a HNV in Musical Theatre at Amersham and Wickham College, Buckinghamshire. Once I had completed my training, I moved to London to try and get my big break. It seemed more important than ever before to look good. Although I was a quite girly, I had always worn minimal make-up but now I spent hours in front of the mirror smothering my face in foundation and plastering on blusher. Whether I was posing for the camera or auditioning for roles, I knew I had to look my best. The last thing I wanted was to look washed out or pale and I’d had to leave my beloved sunbed behind at my parent’s home, but that didn’t stop me. I signed up to a gym and used the one there almost once a week. While I was trying to land a part I decided to get a full-time job in a gym and there I was given free use of the sunbed whenever I liked. I made the most of the perk and was constantly catching rays before my shift, on my lunch break of after work. But more safety conscious, they insisted I wore ‘Winkies’ stickers that cover the eye to make sure they are protected. I didn’t mind too much. ‘At least they don’t have that awful band to hold them on,’ I remember thinking to myself, pleased I would be able to avoid unslightly tanlines on my face. I joined a few agencies and did lots of work as an extra on TV programmes like Casualty, The Bill and Family Affairs. Then finally got offered a role in an episode of Eastender’s as Kat Slater’s mum in a flashback on the hit soap. After that I starred alongside Madonna in musical Evita and acted as a body double for sporty Spice, Mel C. But after my gran died in 2001, I decided to throw in the towel and call time on my career in the film industry. Her death really affected me. When I gave up my job I also quit the sunbeds too. Katie Price’s cancer scare had been splashed all over the news and it worried me sick. Now that I was no longer in the limelight I didn’t feel the need to constantly looked naturally tanned and instead of spending hours under UV rays I caked myself in fake tan lotion if I wanted a glow. I went into the fitness industry and became personal trainer before starting to teach yoga. I was very health conscious, eating a balanced diet and exercising often. Then I fell pregnant with my daughter, Sienna, now seven. But three days later I bumped into my landlord and he said: ‘I really think you should go to hospital if your eyes are still playing up.’ I had to admit the problems just weren’t going away. I went to Ealing Hospital where I was told it looked like I had a lump in my eye. I was sent straight to the eye centre. There they asked me question after question. ‘Has anyone in your family been diagnosed with skin cancer?’, ‘Have you been abroad or out in the sun a lot?’. My mind was whirling. Luckily my friend, Maddie, had come with me to the hospital. I turned to her and said: ‘It must be cancer.’ ‘I’m sure they just have to ask as protocol,’ she soothed. I was told to go to Moorfields Eye Hospital on the same day, where they did lots of tests – putting drops in my eyes and shining lights in my pupils. I had just got on the train to go home when I got a phone call. It was the consultant, who said: ‘Could you come back in? I need to talk to you.’ ‘I’ve been out all day, I’m exhausted and I need to pick up my daughter,’ I sighed. ‘Just tell me, do you think it’s cancer?’ ‘It’s a possibility,’ she said, honestly. ‘But it’s looking that way.’ Deep down I already knew it. On my birthday, 12th April, I was called in for an appointment with my ex-husband, Alex, 32, and our little girl, where they broke the news that I had melanoma in my eye. Half of my eyeball was covered in a tumour. The doctors said only around one in every six million people get it. They said it is only seen in sunny countries and they only thing they could think caused it was my use of sunbeds without the protection. ‘It’s treatable though,’ I was assured. The next month I had an operation to put pins in my eye to mark the area they were going to blast with radiation. Then in June I went to Clatterbridge Hospital in Liverpool for five days of radiation sessions. I had to wear a mask on my face with just my mouth and eye on show. I looked like something out of a horror movie. Each zap lasted for 30 seconds and left my eyes stinging. I was told the treatment had an 80-90% success rate and after three months I had a check up to see whether it had worked. In October 2012 I went to the appointment, but I wasn’t too worried. I assumed the radiation had done enough. But to my horror I was told the tumour in my eye had got even bigger. It was grade four – and there is no grade five. ‘If we don’t take your eye out it’s going to spread and you’re going to die,’ I was told bluntly. I didn’t have a choice. It had to go. On the tube home I cried the whole way back, as I tried to come to terms with the huge change in my appearance. But I had already started to go blind, so that made it slightly easier to bear. I tried to explain to my daughter, who was five at the time, that I was no longer going to have my left eye. ‘Mummy has an illness called cancer and I need my eye taken out,’ I gently said. Sienna just smiled, wrapped her arms around me and told me she loved me. Three weeks later, in November 2012, my eye was removed. I wore a glass shield over it which had a hole in to help it heal. Whenever I did the school run to pick up Sienna I would close my eye so not to scare the other children. But now that it was out, I felt a little better. I moved back to the Midlands to be nearer to my family in May 2013. 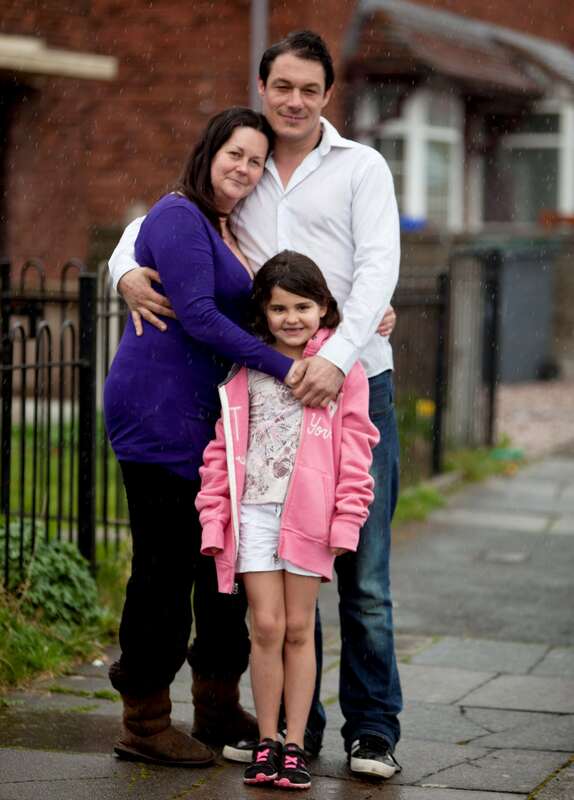 On the estate I bumped into Darren, 36, and despite not having an eye I found the confidence to ask him out. We became a couple not long after. I had been told that there was a 65% chance of the cancer coming back in the next five years. I had check ups on my liver every six months as if the disease was going to return that would be the first place it would show. A year later, this February, I had my last routine check up and I could tell by the reaction of the consultant that the disease had returned. ‘Is everything ok?’ I asked, sensing there was something wrong. ‘It looks like the cancer is back,’ I was told. I underwent a CT scan and biopsy. Then later that month I was given the news that would change my life forever. It was terminal. Debi with her family, facing up to her terminal illness and leaving her daughter behind. That was seven weeks ago and since then I feel like I’ve gone from strength to strength. I want to create lots of happy of memories for Sienna and at first I went a bit mad. I pulled her straight out of school and we all went on holiday to the Lake District. But after a little while I came to terms with it. It’s impossible to imagine not being there to see my daughter walk down the aisle on her wedding day or not being by her side as she gives birth to her first child. But it’s something I have had to accept. I gently told her that I won’t be around forever and that when I’m gone she would need to go and live with her dad. ‘It’s ok, I like living with daddy,’ she said, with a resilience that lets me I know she’ll be fine. The doctors now have me on a trial drug and are giving me chemo to shrink the tumour. That could give me months or years more time. I am going to have to leave my daughter behind. She knows that. She doesn’t understand everything, she just knows that mummy is going to go to heaven soon, that mummy has a nasty disease called cancer and it is going to kill her. All this has happened because I was desperate for a tan. I want something good to come out of my death. If my story stops just one person using sunbeds I’ll be happy. If, like Debi, you would like to share a story and help raise awareness of an important issue, please contact us today. We are continually looking for important real-life stories to fill the pages of the national magazines and newspapers. If you can help those in a similar situation, or raise awareness of a cause or issue, we can help you. We also guarantee the highest fees, which can be paid to you or a charity of your choice. To sell a story to the press, simply complete the form on the right hand side of this page. One of our friendly features team will give you a call to discuss your story talk you though the options. Our service is free (we are paid directly by the publications for providing content). 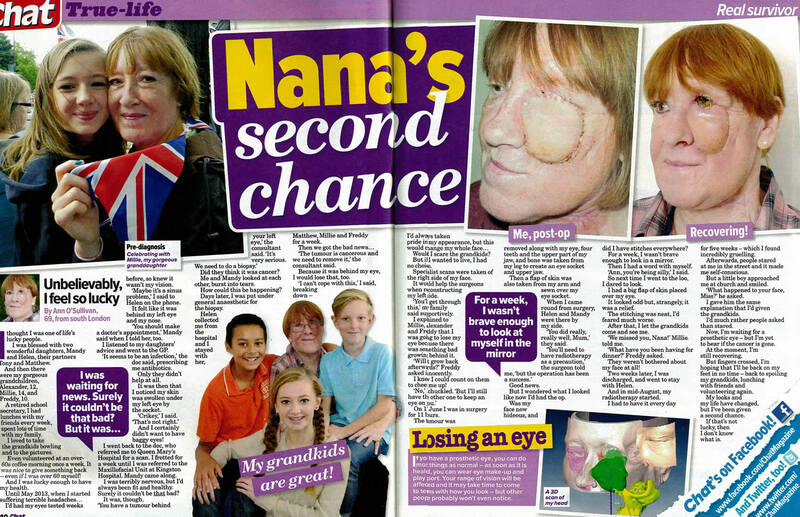 Ann had her face rebuilt using state-of-the-art technology following tumour surgery. Discovering a large tumour had been secretly spreading across her face came like a ‘bolt out of the blue’ for Ann, 69. The grandmother was left with no choice but to have her jaw, left eye and some of her teeth removed. 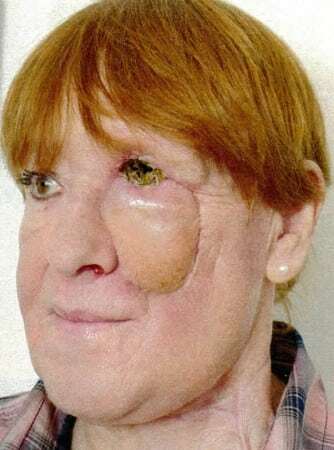 Surgeons used state-of-the-art technology to rebuild the left side of her face – which they replicated using bone from her leg. Ann had her face rebuilt – using a computer scanner. It took over a week before Ann could bring herself to meet her reflection in a mirror but she is now looking on the bright side… And still keeping a close eye on her grandchildren. Ann, visited her GP when her frequent headaches were causing her concern. 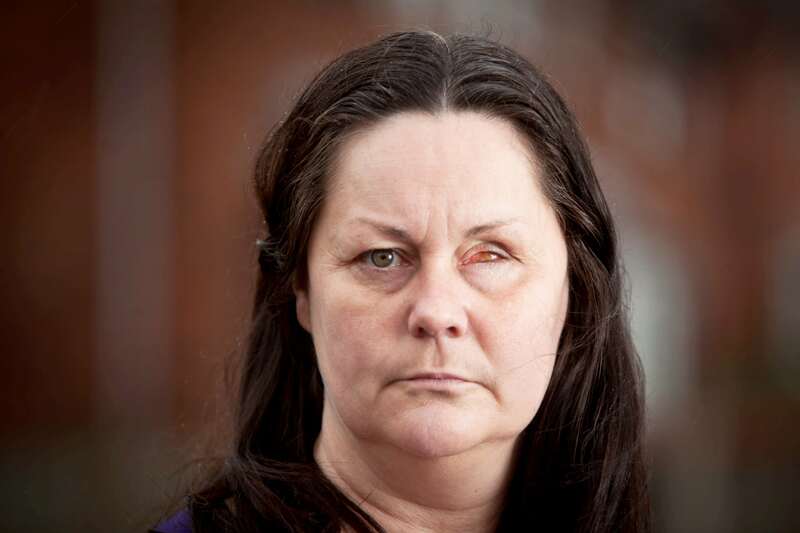 But the cause was not the sinus problem she presumed it to be but something far more sinister – a life-threatening tumour was growing behind her eye. Left undetected the cancer had been spreading rapidly across the left side of her face. To save Ann’s life surgeons had to remove a large portion of her jaw, her left eye, and numerous teeth to get rid of the cancer. 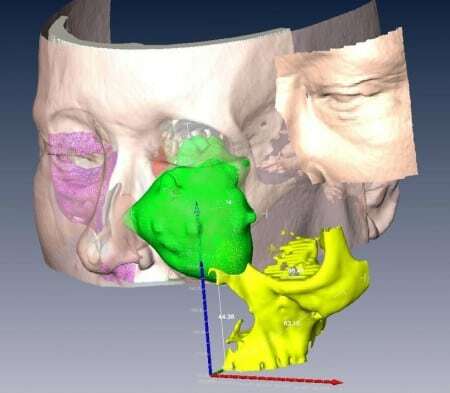 Once this procedure was complete, they began the painstaking work of reconstructing of her face using innovative computer technology to rebuild the damaged area. The technology allowed the team to electronically scan the opposite side of her face to build a 3D profile that surgeons could then replicate. Ann underwent a ten hour operation in a mxillofacial unit which specialises in surgery for facial trauma, deformity and head and neck cancer. The operation involved surgeons taking a portion of bone from her leg to reconstruct her jaw, and a number of tissue grafts where arteries and veins had to be painstakingly re-connected using micro surgery. If you have a prosthetic eye, you can do most things as normal – as soon as it is healed, you can wear eye make-up and play sport. Your range of vision will be affected and it may take time to come to terms with how you look – but other people probably won’t even notice. If you would like to share a similar (or different) story to raise awareness and help those going through a similar situation, please contact us today. You can tell us a little about your story using the form on the right hand side of this page. You can also read more on our Sell My Story page.